When you face the day wearing an Occunomix LUX SWTFR Midnight Blue Men's Flame-Resistant Pullover Hooded Sweatshirt, you'll be ready to tackle anything the day holds. This tough FR sweatshirt is warm, comfortable, and made to keep you safe when you're on the job. ... (see full details) (see specifications) #OCCLUX-SWTFR. When you face the day wearing an Occunomix LUX SWTFR Midnight Blue Men's Flame-Resistant Pullover Hooded Sweatshirt, you'll be ready to tackle anything the day holds. This tough FR sweatshirt is warm, comfortable, and made to keep you safe when you're on the job. This midnight blue pullover is made with a 14.25 ounce fabric blend of tough modacrylic and soft cotton. The lightweight, airy cotton and the durable modacrylic create a machine-washable FR sweatshirt that withstands daily wear and tear. But this Occunomix sweatshirt has even more to offer. It's made with flame-resistant Nomex thread in safe, strong design. This FR sweatshirt meets ASTM F1506 and National Fire Protection Agency 70E safety ratings. This flame-resistant sweatshirt meets Hazard Risk Category 3 requirements and has an Arc rating of ATPV 28 cal/cm2. What's that mean? It means this fire-resistant sweatshirt is flame-resistant, to resist melting, burning and scorching even in high-heat environments. 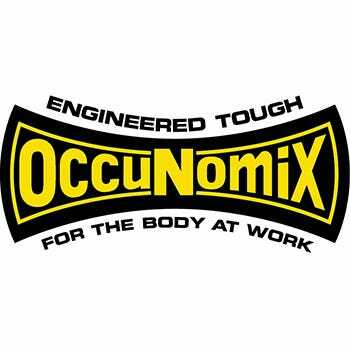 One pouch pocket on this Occunomix sweatshirt becomes storage or a convenient hand warmer as needed. Wear the Occunomix LUX-SWTFR Midnight Blue Men's Flame-Resistant Pullover Hooded Sweatshirt for warmth. Wear it for safety. Wear it for its good looks. Just wear it, and you’ll end up loving this Occunomix FR sweatshirt. This flame resistant sweatshirt runs true to size, it fits me perfectly. I do a lot of welding so the flame resistant feature is nice. This sweatshirt is very warm and comfortable. I like that this pull over sweatshirt doesn't have long strings that get in my way when I am working. Great buy, I am pleased with this Occunomix sweatshirt. Occunomix Sweatshirts: Men's LUX SWTFR Navy Flame Resistant Hooded Sweatshirt is being added to your cart.